Once again the gold standard in multivitamins. Goals: Enhance performance, Enhance recovery, Improve overall good health, Prepare contests, Reduce the effects of aging, Support the immune system. 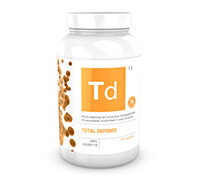 The TOTAL DEFENSE 2.0 is with Vegetarian capsules! Recommended dose: Adults: Take two capsules three times a day. Take with food/meal. Take a few hours before or after taking other medications or natural health products. Recommended use: Helps the body to metabolize carbohydrates, fats and proteins. Helps to form red blood cells. Helps normal growth and development. Helps in tissue formation. Helps to maintain eyesight, skin, membranes and immune function. Helps in the development and maintenance of bones and teeth. Helps in connective tissue formation. Helps in wound healing. An antioxidant for the maintenance of good health. Helps in the absorption and use of calcium and phosphorus. 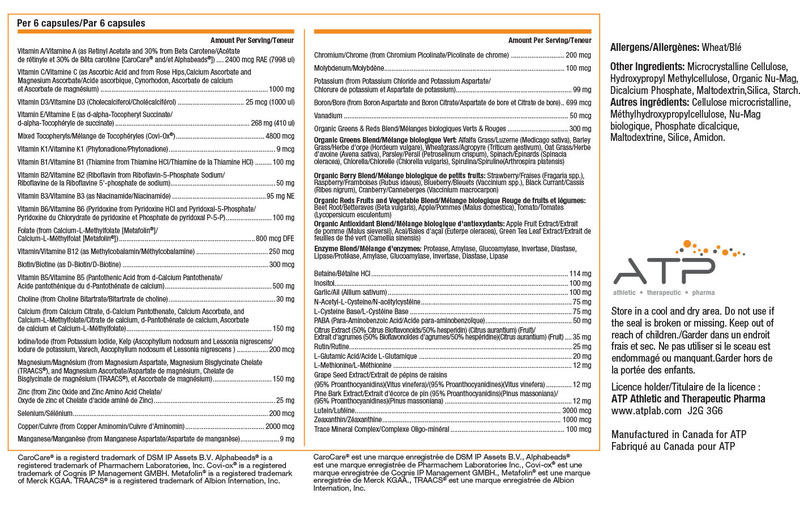 Provides support for healthy glucose metabolism. Helps to produce and repair connective tissue. Helps in the function of the thyroid gland. Workout supplement. Athletic support. Source of amino acids involved in muscle protein synthesis.